joyfulmomofmany: Ground Beef batch cooking- large family style! Next to planning for and teaching school to the children, menu planning and cooking is most definitely one of my most time consuming activities in our large family. Add to that several children who are Celiac and you can see why I love batch cooking! When I had fewer children I would cook 2-3 months worth of main dishes over a two day period~ whew! That was tiring, but super-rewarding for me. As my family size grew, I found that it worked better to cook large quantities of one meal/day rather than to spend two whole days in the kitchen. I like to choose the meat that I am going to use, for instance chicken main dishes or, in this instance, ground beef dishes, and then plan my cooking around the chosen meat. Last fall I discovered that I could get good quality Black Angus ground beef at our local Sams Club for $1.66/lb. The catch? It needs to be purchased in an 80lb box. This meat is significantly better tasting than the ground beef that I used to purchase using loss leader ads at WalMart, so that has been my plan of late. "What do you do with 80lb of ground beef," you ask? I had a feeling you'd ask that! Here's what we're making this time~ with recipes too! *yield: 392 meatballs~ or so, but who's counting! Combine. Shape into meatballs. Bake on foil-covered cookie sheets at 350 degrees until done~ about 20 min. Cool then freeze in meal-sized portions in gallon freezer zipper bags. 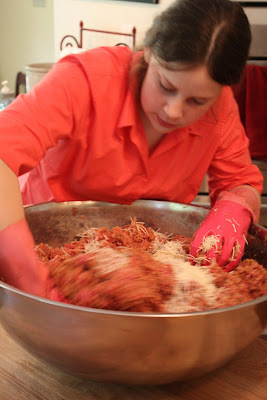 Here are some pics for our recent meatball-making endeavor.... just 'cause. Photos are such fun! 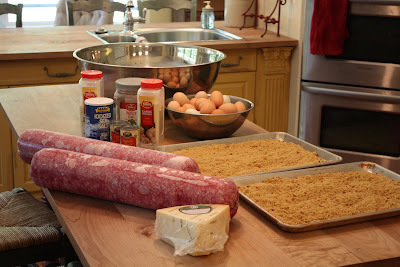 First, a picture of the ingredients. I didn't like how moist the gluten free bread crumbs were, so I toasted them for a few minutes in a warm oven. Here are my beautiful "assistants" (aka daughters) helping me and humoring me as I played with my camera. Abbie is the offical "goosher" (we like to use clean plastic kitchen gloves to "goosh.") Hannah is the parmesan cheese "pourer." Both very important jobs, don't you think? And here is Miss Abbie~ "gooshing away!" The gloves really do help~ that meat is cold! As usual, I got busy in the process and forgot to take any "after" pictures of the finished meatballs. Trust me... they are good! Drain pineapple, save juice. In saucepan, combine sucanat and cornstarch. Blend in pineapple juice, water, cider, vinegar and Bragg's. Cook and stir until thick and bubbly. For our family, I would double this recipe. You can make even larger quantities and freeze it, without the meatballs, water chestnuts and green pepper strips. Combine all of the ingredients and add meatballs. Heat in Crock-pot for 2 hours on high. Serve on (gluten free) sandwich rolls or hoagie buns, split. First, cook and drain ground beef. Then place cooked ground beef in large dutch oven, add spiced and water and cook until water boils. Simmer for a until most of the water is absorbed, then cool and freeze in quart sized freezer bags. We use this with taco salad. There are, of course, many other things that you could use (homemade guacamole comes to mind~ yum! ), but those are the easiest and cheapest. Brown and drain ground beef and chopped onions. Add remaining ingredients and either simmer in large dutch oven or in crock pot on high. Cool and freeze in quart zipper freezer bags. Serve on gluten free hamburger buns with your favorite condiments~ dill pickles are my fav, but dh Tom just likes additional mustard. I like to serve these with oven fries and baby carrots. Simple and good. 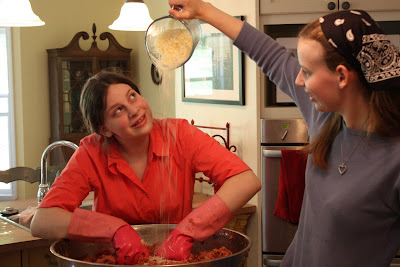 *please note: the following recipe yields 6 9x13 pans of spaghetti pie! Cook and drain spaghetti. Add butter, parmesan cheese and beaten eggs to spaghetti. Form into crusts in oiled 9x13" pans. Spread cottage cheese on top of crust. Brown ground beef, onion and peppers. Drain well. Stir tomatoes, tomato paste, honey, oregano and garlic salt into cooked ground beef. Pour over cottage cheese. Top with shredded mozzarella cheese. To cook: Bake defrosted spaghetti pie in 350 oven for 30 min. If frozen (cause you didn't plan ahead enough to defrost it~ this is usually how I cook it~ honestly!) Bake at 350 for 1 1/2 hour. Still tastes great! Hope this is helpful for someone~ let me know, k? Thank you! I'm saving this and going to ask around for bulk savings! Never thought of asking for that before. Your recipes look yummy, too!! Thanks for sharing all these recipes! Going back on some of your older blogs. This is a great one! We just had GF meatballs and spaghetti tonight, but I didn't have your recipe. I will try it next time! I really haven't tried batch cooking, although it sounds like a big time saver! I'm inspired! ~Cinnamon, I'll try to put together a post like that soon... you are not the first person to ask. I think you'll be amused by our menu though! This was fun, Susan! I have a minute to go back into your archives, and you can believe I'm going to print these out. Menus are one area I want to tackle and overcome this summer. Thanks!